Friday is a day when I try to steer off my usual tech ramblings and look at some fun things. I am going highlight a few things that caught my attention this week and hopefully of some interest to you. AT&T is partnering with Startbucks to offer free Wi-Fi to their DSL customers at any of the zillion err.. about 7000 Starbucks locations in the US. Being a AT&T DSL subscriber, this is sweet news for me! I think it’s planned to be in effect sometime this spring. Ashley of CyberNet News reports that Starbucks ditched a 6-year partnership with T-Mobile to go with AT&T. Does iPhone wielding coffee drinkers flocking Starbucks have anything to do with it? Digsby is a multi-system instant messaging client for Windows and is making the rounds in the blogosphere this past week. Webware is offering a private beta download with the code CNET here. I haven’t had a chance to try this yet but I am already having fun with the SamePlace Firefox Extension. While we are talking finance, you can grab a free e-book, Women & Money by Suze Orman for free at Oprah’s site. The link doesn’t seem to have been pulled but you can still download it from here. My wife says this is much more interesting though. Wow.. Start Wars fans have done it again and have one-upped their previous achievements. 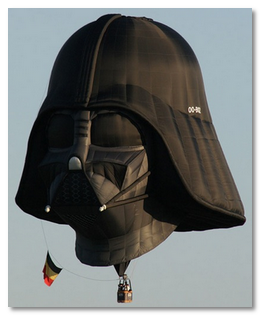 Check out this awesome hot air balloon and read the details of it at /Film. There is even a video of it in action. Check it out. Photographs can capture time and emotions so vividly and WorldPress Photo Awards have announced their winners for 2007. Check out the awesome pictures taken from around the world here. The images at that site are small and are much better here at Google Blogoscoped if you just want to look at the pictures. I am looking forward to a relaxing weekend with a couple of home projects to get done.